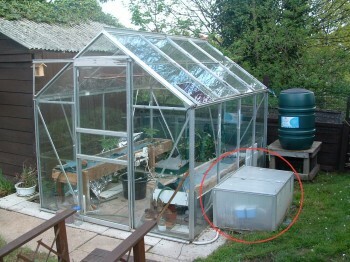 As we are currently in the process of moving house, This Greenhouse is the only one which I have to grow within this year. I have started trying all sorts of new ideas out though, And you’ll find more information about these as you read more of this page. This year though I had to purchase a new air pump for the system as the belows inside the old pump had split during the winter. 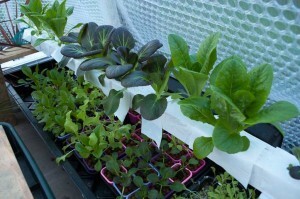 I also purchased two new ready perforated plastic pipes to use to supply the air to the nutrients. I am also running the air pump 24 hours a day to see what effect this has. The system with it’s new pieces and adjustments is now performing much better than last year, To see an example of this have a look at our photo’s from this season by clicking Here. 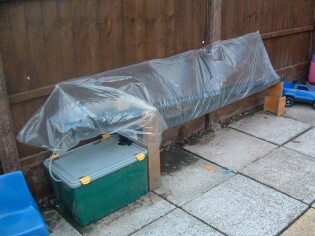 Although this photo doesn’t show it we have also wrapped parts of the Greenhouse in large bubblewrap. This is because the cucumber plants were getting burnt from the sun. 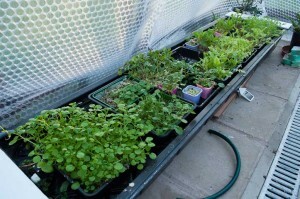 As I didn’t have much space to play with this year having only one Greenhouse I decided to try and grow the watercress outside this year. 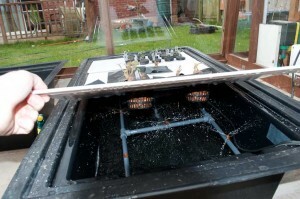 As there is no electricity elsewhere in the garded I decided to try and use solar power, I purchased a Solar Fountain kit from a local DIY center, The kit came with a low power water pump and the solar panel you can see here. 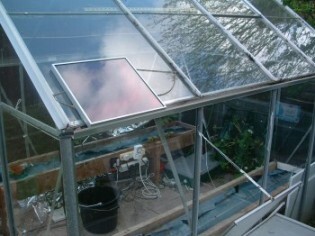 Unfortunately due to the lack of sun in the UK the pump doesn’t run for 95% of the time which doesn’t make it much use, To fix this I decided to built a little piece of electronics consisting of a few capacitors and a timer circuit, What this basically does it charge the capacitors up using the limited solar power available and every 20 seconds pulses the pump for approximately 2 seconds. 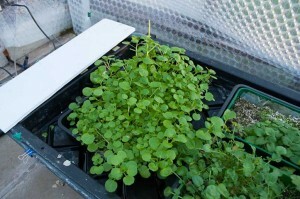 This is enough power to pump a small amount of nutrient solution up to the Watercress channel shown below. 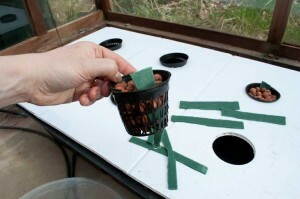 Shown here is the Solar powered NFT watercress system, The system is made up of a nutrient container (The green box) , This contains all the nutrient solution. 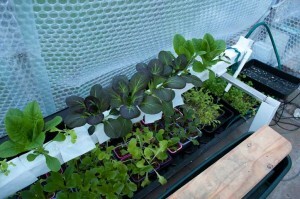 The nutrient is pumped every 20 seconds for 2 seconds by the solar panel, The solution is pumped up into a piece of standard square guttering where it flows down into another piece of guttering underneath and back into the nutrient container to start the process again.